The Lamps of Louis Comfort Tiffany is the first book devoted to Tiffany Studios lamps in more than 20 years. Experts in the field have made available a selection of exceptional lamps, many of which have rarely been seen or published. Each one has been newly photographed with the latest photographic techniques to reveal in extraordinary detail the artistic quality and high craftsmanship of these masterpieces of decorative art. 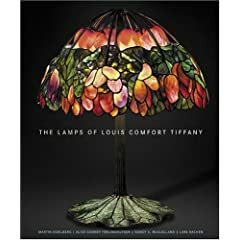 Authors Martin Eidelberg and Alice Cooney Frelinghuysen have contributed essays on the history of the lamps, enlarging our understanding of Louis Comfort Tiffany's achievement. They have also drawn upon a host of previously unpublished photographs, paintings, and watercolors by Tiffany and other artists in his employment. They also examine working drawings and studio photographs to evoke the lost gardens and interiors of Tiffany's country estate, Laurelton Hall, that so inspired him. The authors outline the development and manufacture of the Tiffany lamp from freehand sketch to the finished form, as well as the chief decorative themes in Tiffany's glass masterpieces and their relation to the work of other fin de siècle glassmakers. In this hardcover book, the light, color, and the inspiration of nature co-mingle to produce a deliciously sensuous experience. Author Martin Eidelberg is Professor Emeritus of Art History at Rutgers University and has written extensively on Tiffany. Alice Cooney Frelinghuysen is Curator of Decorative Arts at The Metropolitan Museum of Art in New York. Nancy McClelland is an art consultant specializing in the decorative arts.